Ranchi: Barkagaon’s main road has more potholes than metalling or asphalt on it. The indifferent attitude of the administration toward the daily plight of the residents, made them take things into their hands. On Wednesday, the residents gathered at on the road and manually filled the potholes. Barkagoan, is only 84 kilometers away from Ranchi. “We wrote to every concerned official and approached the concerned offices but no action has been taken. It seems like the government is not bothered about the hardship commuters and residents face everyday. Potholes don’t just affect the travelers but also create problems for the local residents, as it leads to a lot of dust generation,” lawyer, Amba Prasad, told eNewsroom. Amba is the daughter of Nirmala Devi and Yogendra Sao. Nirmala is the present MLA (Congress) of Barkagaon. Both she and her husband have been charged by the Jharkhand government for raising the issue of displacement due to forceful land acquisition for NTPC project in Barkagaon. Sao is a former minister and had been part of the Jharkhand cabinet. During the protest over land acquisition, police firing had claimed the lives of four people. 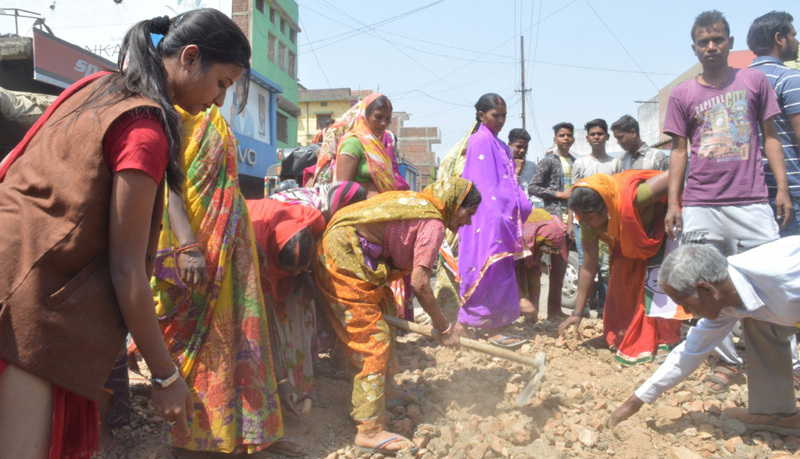 While on Wednesday, as locals turned up in large number for shramdaan (contributing labour for social cause), several women were seen filling up the potholes along with the lawyer.